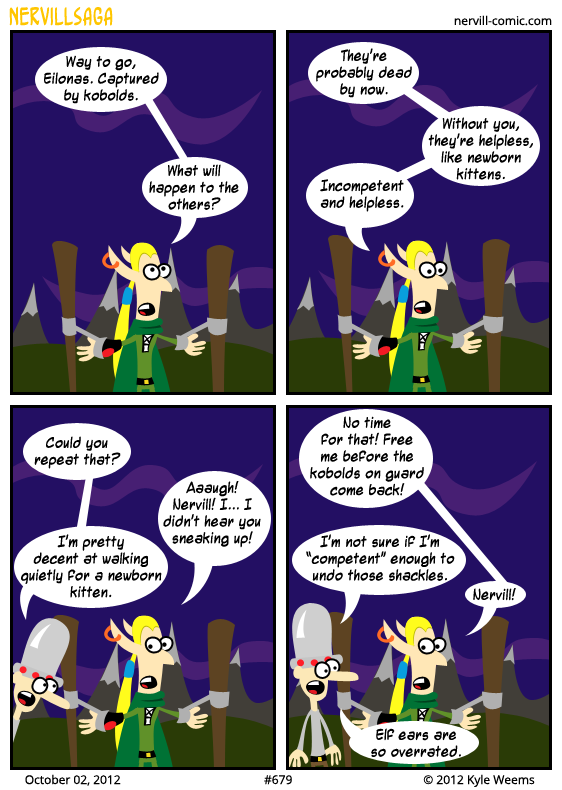 #679: What Do You Hear With Those Elven Ears? It's been six years, six months and four days since Eilonas appeared. By quirk of the plot line and my deteriorating publishing schedule back in 2006, that means he's been missing from the front page for several months longer than the others. He's back now, though. In all his elven glory. Well, not so much glory today. But he has been tied between those stakes for over six years, so we should probably cut him a little slack. I won't make any promises regarding schedules. I've broken dozens of those over the years, and until I've established a production routine that becomes ingrained into habit and enshrined into my schedule I'm not going to say "this is how it is." But at the moment it looks like we'll be seeing something in the "once a week" variety. Which is slightly faster than "once every six years." If that keeps up and I finish out this storyline, then I'll be moving on to phase two of the comic's relaunch, which involves some innovative and disruptive changes to the comic, it's format and other elements. It's the sort of thing that would have gradually happened over six years anyhow, but is going to be a bit of a shock as I catch the comic up to where I want it to be in this day and age.